Everyone is in a fix for healthier recipes, easy to make quick snacks and make ahead treats. 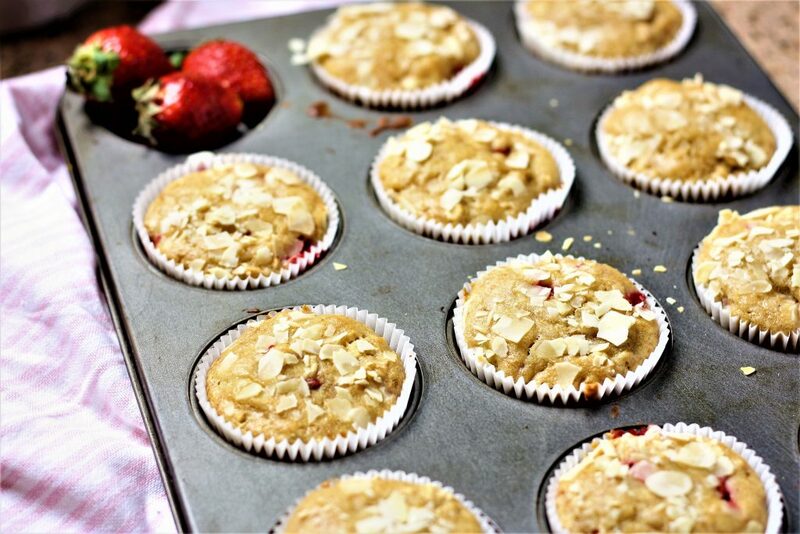 This healthy strawberry recipe which is basically strawberry muffins made with whole wheat flour and oats are excellent nutrients packed and can be easily categorized as healthiest muffin. No sugar, no refined flour, no butter ticking all the boxes of a healthy treat. I am a big fan of muffins owing to its simple process and possible variations. 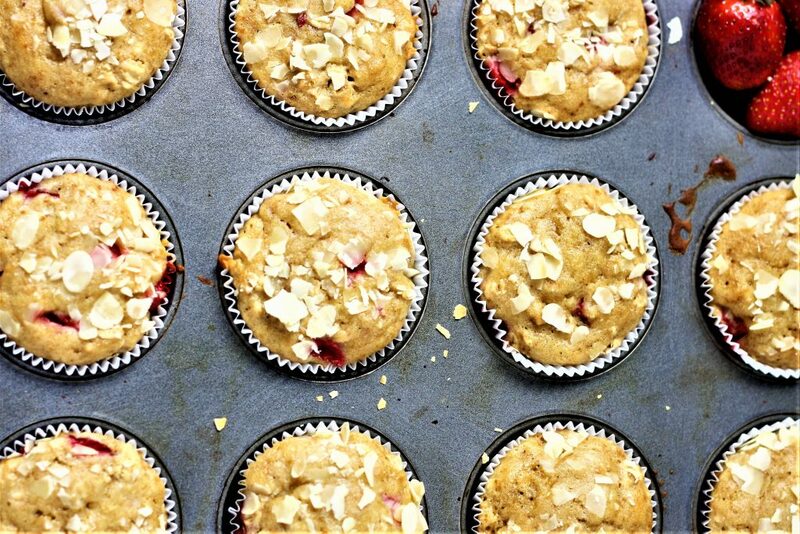 I have posted my go to muffins recipes on the blog and you can find them here. Lets get straight to the recipe. You can use any type of oats but I prefer whole/old fashioned type. You can use regular yogurt instead of Greek, just drain the excess water. A sprinkle of sliced almonds not only adds the crunch but a visual appeal as well. As like other muffins, you can store them in airtight container for a couple of days and in freezer for a couple of weeks,wrapped and boxed. 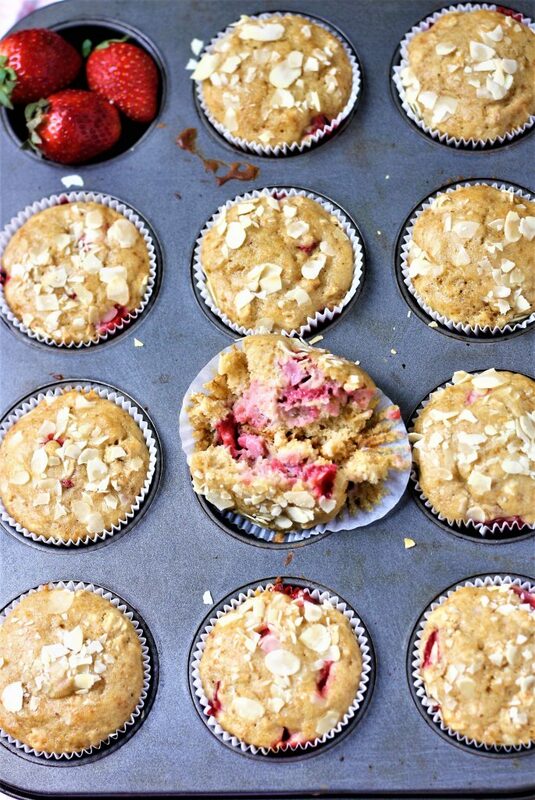 Line the muffin tray with 12 cupcake liners and preheat the oven at 350 F.
Whisk all the dry ingredients together in a large bowl except strawberries and almonds. Whisk all the wet ingredients, eggs, yogurt, oil,honey and vanilla. Mix the dry ingredients with wet until just combined. Do not beat. Few lumps are ok.
Place 1/3 cup of batter with the help of a scoop in the muffin tray. Bake for 20 minutes until light brown on top. « Halwa Poori Recipe – How to make this Pakistani breakfast at home! I have been on a look out for healthy snacks now a days and this is a perfect post! A query: can i use quick oats? oh sure Rahma, you certainly can.i am glad you found it and i assure you wont be disappointed!